Fagus sylvatica, or the European Beech, are a very common sight in the UK tolerating shallow chalk and clay soils. As a child growing up in the Chilterns Hills outside London, tall majestic Beech woods were a common sight. As such a common native UK species, Beech saplings are often collected to develop as bonsai. Unfortunately, they are not an easy tree to use for bonsai successfully. Trunks take a long time to thicken, backbudding can be awkward and sporadic and the development of ramification in the branches takes a long time. Many Beech bonsai issue just one flush of growth each year during May. Field-growing Beech and very vigorous Beech bonsai will then have a second flush of growth in July. 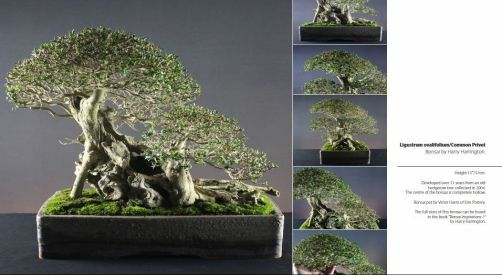 This slow growth rate coupled with a general lack of backbudding can result in Beech bonsai having long and bare primary branches that just have ramification on the tips of the branches. Trees like this then need to be rebuilt from the inside outwards. It is very important to realize that while a trunk-chopped Beech will issue new adventitious buds, any branches that are pruned back (shortened) must be done so that there is at least one visible bud left, otherwise the whole branch may fail and dieback. The main aim of this article is to address both the problem of slow growth and the lack of backbudding in Beech bonsai, through the use of pruning and defoliation techniques. Beech bonsai can be thought to have a 'pre-determined' leaf surface-area limit each year; that is, when the tree has produced and hardened off a certain surface area of leaves in the Spring, it ceases to grow for the rest of the year. By pinching back new shoots as they extend and defoliating (removing new leaves) before the leaves harden off, the tree is repeatedly forced to try and replace this lost growth, very often by producing new buds and shoots on the inner areas of the branches. Beech shoot in early May, only 3 days after the bud started to extend. This is the ideal time for pinching back this shoot. As the new shoots start to extend in Spring, pinch/cut the new shoots back, leaving the first 2 leaves at the base of the shoot. Weaker low and inner shoots can be cut back to 3 or 4 leaves if necessary or left longer if extension is required. Images showing the relative strengths of two Beech branches. The strongest buds (a) should be pinched back hardest in order to strengthen the weaker buds (marked b). The weakest buds (c) will fail or only produce a single leaf and no new shoot, unless the strongest buds (marked a) are pinched back. This pinching will result in a second flush of growth in a few weeks time and prompt buds further back along the branch (that might otherwise have remained dormant) to leaf out and extend new shoots. The Spring buds of a Beech do not all open at the same time as can be seen in the images above; the strongest buds will open first followed by the weaker new growth. It is therefore necessary to carry out pinching back 2 or 3 times over the course of a fortnight or so. Pinching back to 2-3 leaves will ensure that all remaining inner buds will go on to produce a new shoot and not fail. One major advantage of pinching back Beech spring growth is that it reduces both leaf-size and internode length. This is particularly important for healthy and vigorous bonsai that would otherwise produce coarse growth. Beech can produce such dense canopies of leaves that the branches on the interior die back. New inner shoots and leaves will also fail to open and replace them. As the new leaves set and turn to a darker green colour they begin to shade out the branches and can make a very dense canopy in which only the buds at the tips of the branches have access to light that will prompt them to swell and open. Allowing more light into the canopy will help strengthen the inner shoots and branches but Beech can respond poorly to full defoliation (complete removal of all of the foliage at one time). However, they respond well to partial defoliation. Start to partially defoliate by removing the largest leaves found on the tips of the branches, this allows more light into the inner branches and strengthens the inner buds, leaves and shoots. After partially defoliating/removing the inner leaves. Removing a leaf causes the bud at it's base to extend. Where a leaf remains the bud will not extend. Always remove leaves from the inside of a branch but retain most of the leaves on the tips of each shoot; this will encourage the buds of the defoliated leaves to open and extend while keeping those buds at the tips (with their leaf remaining) dormant. This is the primary way of causing backbudding and strengthing the weaker inner buds and branches in Beech. Partial defoliation will prompt a second flush of growth in Beech; the resulting new buds can be pinched if necessary, as described earlier in the article. Further partial defoliations can be carried out on healthy trees during May and June to keep them producing more and more flushes of new growth. However, it is recommended to feed aggressively and to allow the tree to rest from July onwards. In Winter or early Spring, Beech can be pruned back to take advantage of backbudding that was produced in the previous year. This image shows a new branch that was produced using pinching and partial defoliation techniques in the previous year. (The dead leaves that cling to the branches of Beech have been removed in these images for clarity). This new growth can be pruned back during dormancy in the Winter to create natural movement and taper in the branch. It can also be carried out so that the strongest buds and the foliage that follows (next year) are closer to the trunk. Pruning back at this time can be as hard as required. Branches can be pruned back very hard to create very strong taper and movement in the branch and to shorten the overall length of the branch so that the resulting foliage is closer to the trunk. The bonsai will respond well to pruning as hard as this as long as that vital last bud is left so that the branch does not die back.